Do you have 1 hour a week to share? Would you like to make a difference in someone's life just by providing companionship? 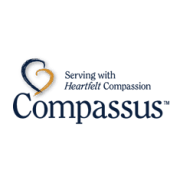 Compassus Hospice is seeking compassionate, caring volunteers to spend time with our patients engaging in activities of the patient's choice, such as reading, going outside for walks, chatting or listening to music. If this opportunity speaks to your heart, contact Kim Iannacci at 978-777-8222 or email at Kimberly.Iannacci@compassus.com. We provide all the training and support you will need to succeed and we look forward to meeting with you to discuss our opportunities.